Bocce, is an ancient sport little known in the United States until around 1989 and has finally begun to take root in the American sports culture. Bocce was first documented in a 5200 B.C. painting of two boys playing, which was discovered by an English scientist, Sir Francis Petrial, in an Egyptian tomb. Bocce spread throughout Palestine and into Asia Minor. In 600 B.C., Bocce was picked up by the Greeks and passed to the Romans. It was played everywhere, from the churches and castles to the city streets. People from all walks of life could play the game; young or old, man or woman. In 1319 A.D., Bocce was actually prohibited to people of lesser nobility because it was felt that it diverted attention from more important tasks, such as archery and war training. In 1519, Bocce became a public game. It was played in Flanders, Holland and Belgium. Greek colonists brought Bocce with them to what is now modern Italy. It became so popular that it was once again threatened with prohibition, as people who were playing Bocce in the streets were hitting the knees of passing noblemen with the Bocce balls. Although unfortunate for the humbler people who played Bocce, this problem brought widespread attention to the sport among Italian noblemen and Bocce immediately became a favorite pastime. Bocce was popularized in modern times in Italy. It was Giussepi Garibaldi, who, while unifying and nationalizing Italy, popularized the sport as it is known today. Bocce frequently lost and gained popularity throughout the ages. In 1896, during a resurgence of popularity, the first Bocce Olympiad was held in Athens, Greece. Bocce has been a part of international sports ever since. Bocce has seen many changes throughout the ages. It has evolved from being a crude sport played with rounded rocks, or even coconuts, to the modern game with composite or metal balls. Bocce has been known under many names – lawn bowling, nine pins, skittles, pentanque, to name a few – and has seen many rule changes. The popularity of Bocce in America has been on the rise since it swept California in 1989. There are more than 25,000,000 Bocce enthusiasts that have heard of the sport, play recreationally, or play on structured courts in the United States today. Bocce has also become a tournament sport. Tournaments are held weekly, some carrying large cash awards for their winners. Bocce is now a part of the World Corporate Games, is an event in the Special Olympics, and is being proposed to be in the Olympics. Bocce can be played upon any level surface by anyone who is willing to try. It is a game for all ages, gender and athletic ability. It is a very versatile game in which the rules may be changed according to the players. Play may range from a nearly nonexistent set of rules to the strictest of tournament rules. Bocce for the average players is very simple. There may be anywhere from two to four to eight players on a team. Each player is given two balls. Each player must then take turns rolling (lagging) the ball toward the pallino ball (the smallest ball), which has already been thrown onto the field. The players are given points for the balls thrown closest to the pallino. Players may also throw on the fly (volo), striking the ball to move the point ball. Balls, including the pallino, may also be displaced by the balls of other players. Bocce is an inexpensive game of thought and strategy that brings families and friends together with the enjoyment of a game that everyone can play. 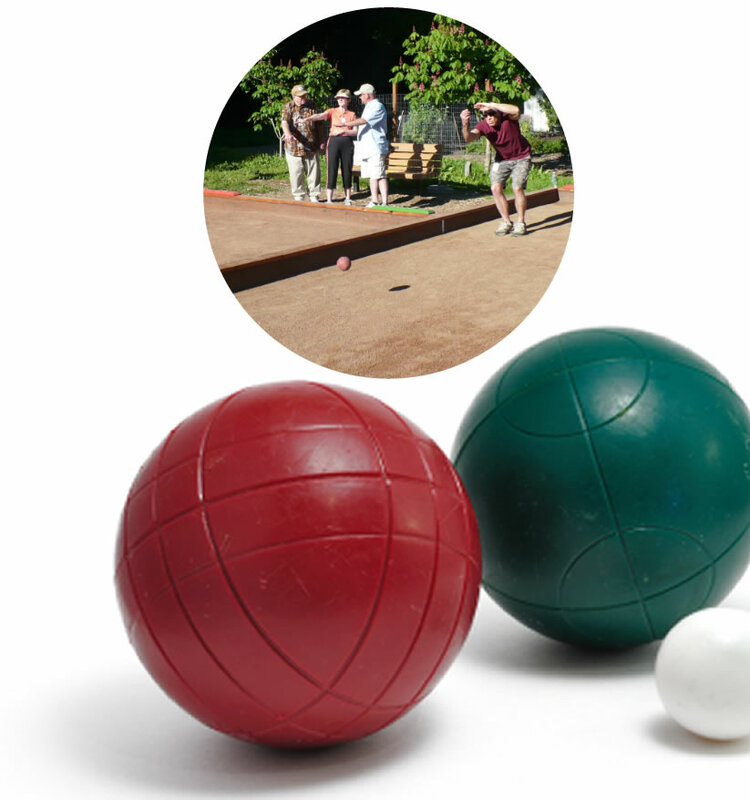 There are many ways that you and your family can become involved with Bocce. As well as being able to play it in the neighborhood park or your own backyard, many other locations are now springing up at country clubs and commercial recreational centers.